This probably exists with some variation in every region in the country, but where I live, Illinois drivers are the worst. That’s the stereotype anyway. And if Illinois drivers are the worst, Chicago drivers are the worst of the worst…three-lane-changes with no signal, cut you off as soon as look at you, etc., etc. 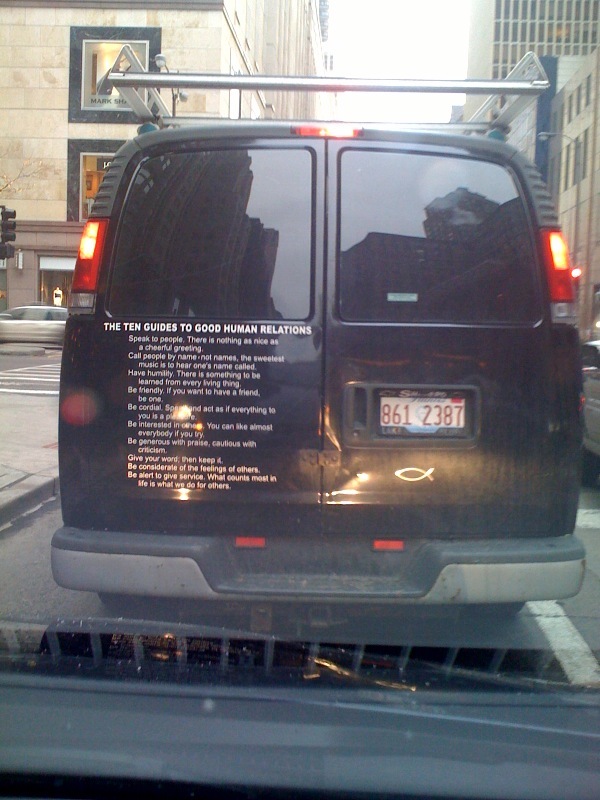 So it was a pleasant surprise to see the following on the back of the van in front of us on Michigan Avenue in downtown Chicago yesterday. Speak to people. There is nothing as nice as a cheerful greeting. Call people by name – not names. The sweetest music is to hear one’s name called. Have humility. There is something to be learned from every living thing. Be friendly. If you want to have a friend, be one. Be cordial. Speak and act as if everything to you is a pleasure. Be interested in others. You can like almost everybody if you try. Be generous with praise, cautious with criticism. Give your word; then keep it. I’d say I have to work on about nine out of ten of those. AND I’m going to have to reassess my attitude about Illinois drivers!